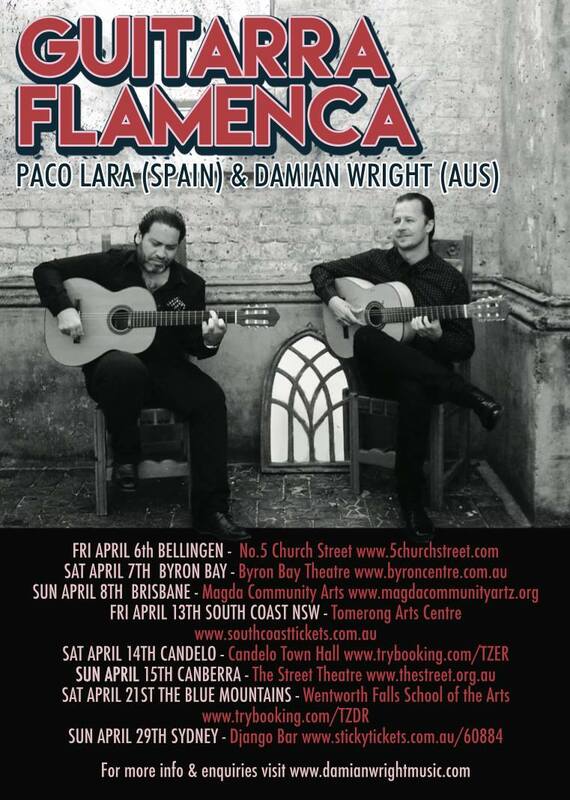 “Acclaimed flamenco guitarist PACO LARA (Jerez de la frontera, Spain) together with ARIA nominated flamenco guitarist DAMIAN WRIGHT present a performance of spectacular flamenco guitar music as well as music by Chick Corea, Jorge Cardoso & more. Also featuring JAMES HAUPTMANN on percussion. Embodying the unmistakeable Jerez style of flamenco guitar playing, Paco Lara presents the flamenco guitar in all it’s authenticity, culture and artistry. Apart from his skill as a formidable soloist, Paco is also revered for his ability as an accompanist in the specialised world of flamenco singing (cante) and (dance), where he has performed with Flamenco’s most significant artists including Beni de Cádiz, Juan Moneo “El Torta”, Miguel Flores “El Capullo de Jerez”, Tomasa Guerrero “La Macanita”, and Mercedes Ruiz, participating in prestigious festival programs including Bienal de Sevilla (Spain), Casa de la Música, Moscow (Russia) and more. In 2014, Damian Wright was invited to perform as a solo artist at The Rajasthan International Folk Festival, India, and in 2016 performed at The Shanghai Fringe Festival, China. Damian’s flamenco ensemble Bandaluzia were invited to perform at the biannual Adelaide International Guitar Festival curated by Slava Grigoryan, and performed to a sold out Sydney Opera House Concert Hall as part of TedX Sydney 2014. Available online from The Street.